"Another awesome repair. Had a Longines 1950's watch that needed much restoration. After discussion and inspection, considering my needs, they recommended sending out to an out of state repair person. The watch that returned was so amazingly improved from the one I dropped off, I was amazed. I thank Perri for all their work in making sure my watch and jewelry repairs are done right the first time. Awesome people." Great experience, went in to get a engagement ring and the owner was incredibly friendly and helpful, great local shop. This is a fantastic local business with great customer service. I requested a quote through email for getting a watch engraved and received a response from the owner within the hour. The staff helped me pick out the lettering and it was ready on the day they projected. Very friendly owner and staff, and they did a great job! Would highly recommend! Great place to get my watchband adjusted. Fair prices and it had the look and smell of a real shop, not some fake chain. "Brought in my grandfather's ring that he wore for 55 years. It was in good condition but has terrible scratches on it. When I went to pick it up, it looked like a brand new ring! It only cost $10. Everyone was extremely nice and professional and I definitely recommend this place." "My wife's wedding ring had lost one of two small diamonds and required re-welding of the band. After examining the ring I was advised that one of prongs holding the master diamond needed replacing. All of this work was done to my complete satisfaction. I also had a man's ring with a Rolex bezel mount that initially had an opal triplet cabachon. The opal was very soft and over time disintegrated. I bought an amyethyst cabachon on-line and asked that it be installed in this mounting. Again, both jobs were done in one week to my total satisfaction. The quick turn-around and very agreeable price will send me back to Perri should the need arise in the future. It's a small store but I would recommend this place to anyone requiring jewelry repair. They also carry a large selection of watch bands which is something most places don't these days." "These guys are amazing! Fast, friendly, affordable, good local service. I went in there to have a watch band adjusted after running all over 4th Ave where nobody could do that for me. I will definitely go back next time." "Took in a diamond ring inherited from my Mother. Steve took lots of time to help me pick the perfect setting to transform it into a pendant. This company is the best. We've been doing business with them for over a decade." "I'm going to be sad when and if this compact, no nonsense establishment with knowledgeable staff closes. I've only patronized Perri's a few times (always for repair), but I always leave there more satisfied than anywhere else I patronize, except for my mechanic and physician. My visit 3 days ago confirmed this. Again. My reasons are fairly simple: I always feel as if they listen and understand the problem I bring to them, and completely understand what they explain to me. I always feel as if I've received very above average value, fee/price-wise, when I leave the store. I don't purchase jewelry very often, but this will be my first stop because of the level of trust they've established with me. 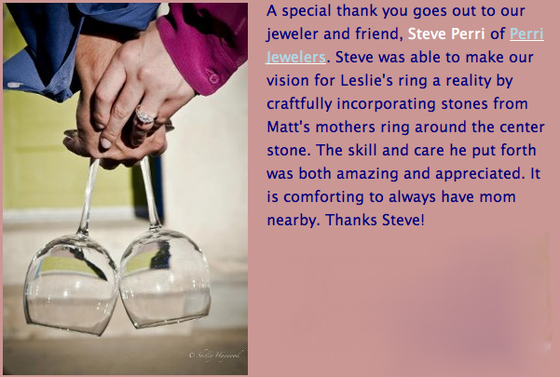 "I can't express how satisfied I am with the service I received at Perri Jewelers. I just got married and needed my three ring bridal set soldered. I called many different jewelry places around town. Perri Jewelers were the least expensive and had the fastest turn-around time. Not to mention great customer service!" "My dog had ripped my watch off my wrist and bent both spring bars, so I found Perri Jewelers through a Google search and decided to take my ring in to get re-sized since i was going in anyways. The ring resizing was less than $30, he tightened the settings on the stones and fixed a flaw on the band at no charge and even fixed my watch for free! I got the springbars through the manufacturer but was told they only cost a few dollars at Perri's compared to around 10 dollars each at the mall! The shop is cozy and clean and I will definitely be back. very pleased with service, price, and location. Highly recommend!" "3 watch repair shops and 2 continents later, my watch got fixed by Stephen Perri!! All 3 of them told me I had to send it back to the manufacturer Tag Heuer but we know doing that will cost just as much as the watch itself so I never did. It's been sitting in my drawer for the past 2 years. I decided to give it one last shot and I'm fourth time lucky! Stephen happened to have the special parts for luxury watches and ta-dah! It's fixed. All that for $40! Amazing!! I've brought 3 watches to them so far and all 3 of them were fixed/done in no time. A 1950s vintage Girard Perregaux, a current day Casio G-Shock and a Tag Heuer. They are truly experts in watches and I highly recommend them." "The customer service at this place is absolutely phenomenal. The two ladies that work there are very helpful and Mr. Perri himself is very knowledgeable. I have brought in multiple watches for repairs and all were done quickly and at a very fair price. I would definitely recommend this place to any one!!!!!!!!" "Thank you for rescuing so much of my jewelry over the years! I've been enjoying my sapphire ring again!" "It's a pretty small little place and it's kind of hard to see with all the construction, but when you find it you'll be glad you stopped in! Super friendly staff and very quick service. Convenient location for anyone attending the U of A or who lives on the central or west side." "Just had them clean up and put two new batteries in my watches. Very friendly! They also seemed very knowledgeable and helpful! It was also very reasonably priced. I couldn't ask for more! I highly recommend this jeweler for watch repairs." "A coworker suggested I come here when I needed to have a ring resized. That went well so next I brought three watches that needed new batteries. Went well, too. We tried to find a new watchband for one of them - unsuccessful because the band has to be narrow, long, and navy blue. Next task, find a seed pearl to put in a space on a ring I've had since childhood. Success! What's next? I have lots of little projects like these that have piled up over the years : )"